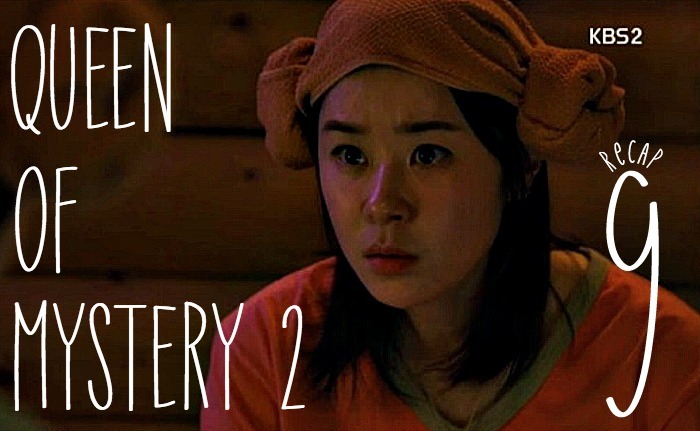 I really enjoyed the last three episodes of Queen of Mystery 2! Why couldn’t they just start the show here?!? This episode solves the mystery at the school and opens a new mystery as Seol-ok and Wan-seong try to solve the mystery of the lost ring. We also get to see a lot more of Kyung-mi, which I love. I am glad we didn’t drop this show after the opening 4 episodes. Hopefully, everything keeps moving along at this pace where we see more of our fantastic crime fighting team coming together. All the kids run out of the building because the student manager keeled over dead. WS confirms it and SO uses her super mind to think about the case. She looks over the bodies and thinks that he somehow died in a place with a lot of people and yet no one saw it. There is CCTV all over the room, too. The friend finally makes an appearance outside the building! But then she goes inside another building. It looks like she goes inside the police building. She is looking for Hwang Jae-min (weird forensics guy) but he isn’t there. She leaves, but she drops her ID. SW sees it and gives it back to her. He asks her if she is looking for Hwang Team Leader? Actually, he is going that way as well. He walks her all the way there which leads KM to think that he has very good manners. But then he tells her not to be scared, he won’t hit a person or anything like that. KM is basically like, um, what? She knocks on the door and JM opens it. He asks her if she would like to have some tea? She goes inside the lab and JM goes outside to make some coffee. There is a funny scene about SW and JM interacting over the coffee (no coffee for you!) And then JM goes back inside the CSI room. KM laughs at JM’s jokes and thinks in her mind that she is Kim Kyung-mi, she is good at these things. JM tells her that she can contribute to the footprint database. Will she be okay doing it? But then he locks her in the room? He says he doesn’t want to be bothered by anyone and starts approaching her. She gulps down her coffee. We cut to the boarding school. The news says that the street is opened again and WS and SO are inside looking at the CCTV. They wonder how the man died because the criminal was not in the room. They go back to the dead bodies and look over the bodies. They look at their fingers and eyes and basically inspect their bodies. Then they go outside and the three students that helped them all walk up to them. They think staying next to WS and SO is the safest place. They talk about who died first….the cat. When they first came there, the cat was still alive. Maybe the suicide stalker killed it? SO thinks the stalker is still alive, it was only a rumor that she died. Perhaps she is hiding somewhere. They wonder if it is possible to kill someone without seeing it on the CCTV. WS thinks it has to be someone who knows the inside of the building very well. WS wants SO to tell him her idea. But then the manager of the teachers comes out and tells them that the phones are working again. They can call WS’s police station. So WS calls them and talks to the forensics guy. But the forensics guy isn’t so responsive to being told what to do. WS tries to sweet talk him by saying he is super smart. That makes JM say that he understands their situation. JM says that he will find out if there are similar cases. They hang up and JM tells KM to give something to him. KM is all like, huh? JM wants her to write what she heard, but she says she doesn’t remember. He screeches at her about something and she is all like…wow, this man is off the wall bonkers. Back at the Boarding school, SO thinks everyone was poisoned. They call JM again and tell him they think it was poisoned. SO gets on the phone and fangirls with JM. She asks what kind of poison and he happily tells her all the possibilities. It could be a poisonous mushroom. JM gets off the phone and says that she is sure that it is poisoning. If they are poisoned, then they don’t have to be on the scene. This also backs up everyone thinking that it is a ghost. The study girl thinks it is suspicious since it is one week later, but is it just a coincidence? SO doesn’t think so. She thinks that this ghost girl might have come back and snuck into the office. (We see the girl hopping into a window). The team walks to the same window. This is the only place without a CCTV. They think that this girl was hiding in the employee office. JM asks KM how she liked her work for today. She says it was her first time doing it. He laughs and says that he will make sure that she has her training there. She thanks him and tries to politely get out of him as her trainer. She makes excuse after excuse, but he always has a reply. Then he says that he already made all the preparations. And in the end, she gets shh’d. JM slowly backs out with KM watching him like she can’t believe she will have to spend more time with him. Back at the boarding school, the teacher manager meets with the kids and the investigators. They ask him all sorts of questions about the ghost woman. He says she was an accountant and she always drank tea. They want to know; did she share it with the cat? He says, I think so. They go through her trash and smell a tap water smell and maybe Clorox? SO dumps the trash and asks for a cigarette. SO puts on some gloves and goes through the tea bags in the trash, that is when she finds something. There is a cigarette filter inside the tea bag. The study girl says this is the same Clorox smell. Maybe this is amatoxin. This exists in poisonous mushroom. You die after one week of liver failure. This place is the perfect place to get poisoned because tea bags are always accessible. WS wonders how she got those things in this country. Someone had to sneak it in. (they show a vision of the ghost girl putting the poison in the cigarettes. She puts the cigarettes back and the boyfriend takes them. It is a good place to put poison because it is not a common cigarette.) She could say that one-week thing because she knew about the cigarette. But it was only for the guy, not the manager. But the manager stole a cigarette and the boyfriend complained about it. They think that whoever had the cigarette with the poison is the criminal. She asks SO, you don’t smoke, so how come you have peace cigarettes. I saw it in this drawer. She opens the drawer, but the cigarettes aren’t in there. But then she finds them and holds them up. She asks what this is. He asks why she searched his drawer. She says she wasn’t looking, she just stumbled upon it. You switched the cigarettes to kill the boyfriend. (We see an image of him doing this) You spread the rumor around that she killed herself and you were the one threatening the accountant (image of him telling the girlfriend that he saw her). You knew he would die, that is why you told them. The man grabs the cigarettes and runs away. WS chases after him. It’s a chase scene through the school! But WS loses him. We see the manager reappearing on a terrace area in the school. He breathes hard and grabs his head. Then he pulls the cigarettes from his pocket. He says it finally ended. Flashback to what really happened that night. She tells him that she put the poison in the filter, she has to go back right now before it gets too late. He says he will take care of it. He will call them. You said they will die after one week? She says yes, she used to work in a chemistry lab, she got it to take her revenge, but she was crazy. He tells her that it is okay, it’s okay. But then we see an evil smile in the reflection. The manager goes to a convenience store and buys the Peace cigarettes. He replaces the cigarettes at the school and starts preparing all the poison. He did everything. Cut back to the terrace. The manager pulls out one of the peace cigarettes. But WS shows up right then and they start to fight. He puts him in an arm lock and says it takes one week to die, you should confess. Cut to the man walking away in cuffs with police around him. SO and WS watch him. The ghost girl is alive at home. But she will also be prosecuted because she tried to poison someone. The students all come out. The school will close for a while so they all have to leave. The fanboy also lost his job. SO walks away and talks to the manager by herself while WS tells the kids to study hard. WS asks what she talked to the manager about. Why did he kill the accountant? Did he take money from the school? How did you know that? (He killed him because the accountant figured out that he took money from the school). WS tells her to see a shaman since cases follow her around. And why didn’t she tell him! He rescued her many, many times. But she says that that number is the same as the number of unsolved crimes she solved for him. He gives her the employment notice of the desk job. He tells her that she doesn’t have to take an exam. She wonders what office work is. He tells her it is basically a position where you will know the accident the first. You control the work. You can pick whatever you like. He is basically making the job sound way better than the police officer explained it to him. SO thanks him for it. Cut to her friend seeing her store is closed. She wonders what is going on, a 3-month vacation? She thinks it is her fault for asking her to take care of the store. Cut back to SO and WS driving back to Seoul. SO thinks it is spring now, she didn’t even know it is Spring now because she was studying so hard. The radio says that someone will propose to their girlfriend, will he accept it? This makes WS and SO think back to the missing ring. Flashback of a drunk WS practicing giving the ring to SO. WS asks ajumma why she is ignoring the ring. It is an expensive ring! He didn’t buy it for her, he has another owner for it. Give it to me! She asks why he is asking her? She doesn’t have it. They both start thinking about this. But they don’t resolve it. The bakeshop owner meets with JS as soon as he gets out of jail. She gives him a gift and looks so happy that he is out of jail. She says that he suffered a lot, but he thanks her, because of her, he came out early. He thanks her again and says that we will use the coat a lot (it is her gift to him). He asks where she parked; she says he took the bus. They both wait for the bus and ride it together, but JS has no idea how to ride a bus. HY has to help him out. They chat about the bus and smile. She tells him that they should sit, so they sit next to each other. She opens a window and enjoys the breeze. HY prepares for the event that her company has with Ha In-jungs company. This is for a kids Hospital event where the hospital children can come and enjoy all that they want to enjoy. Then we cut to HY and JS walking down the street. They end up going to her house (it is so pretty!). He tells her that her place is pretty, but she says it is more her parents taste. She gives him a coffee and he asks her to help him take care of the charity event. She wants to know why her. He tells her that she likes to help people, so he is asking her. They both finally get home. WS thinks they can just sleep. But then km busts the door open and welcomes them. WS is so startled, lol. Ah, km doesn’t know that WS lives there now. She goes back inside, and they wonder what they should do. They talk about how the food smells so good. Maybe they can just go inside and eat first. Cut to them both eating like crazy. Km wonders if they starved without her and they talk about how great the food is. But the more they talk the more they let it slip that WS lives there now. They try to play it off. SH has a new house that is too big for him. He is moving into it now and putting all the detective’s things up. He thinks WS…..Hyun-soo (WS’s dead girlfriend)…. Then we cut to the woman that says she is Hyun-soo. She is giving a performance on set. It is a theater performance. She says she has many names. She asks the audience, how many names do you have? Today…what is your name? Then we cut to her room in the back. She tells someone to have a good day and the lights cut off. Someone says, Seo Hyun-soo, and the actress takes off running. She hides somewhere and texts someone. Actress: I am Seo Hyun-soo, can you help me? I am being followed by someone. She runs away and is followed by the man. But it looks like she is able to avoid him. She tries to call someone but just then the man finds her, and the screen goes to black. SO tells KM that she can wash the dishes, but KM says she can do it and SO can take care of WS. SO texts WS, did you pack? Cut to WS putting on all his clothes. He texts SO and tells her to take care of the restroom. SO goes to the bathroom and cleans all the things (even though KM really has to go). WS comes out and KM tells him that he looks fat all of a sudden. Meanwhile, SO is stuffing her pants with all of WS’s bathroom things. She comes out and tells KM that she can use the bathroom now. KM thinks something is weird, SO also looks fat all of a sudden. WS and KM take off and dump all the things in the car. WS thinks he can go to a sauna, but it will be uncomfortable. Detectives can’t sleep at saunas. WS goes to the sauna and SO joins him later. She brings him his shoes. He tells her that she wore his shoes that day, doesn’t she remember? (It was the day they looked through his house). They decide to just have a good time in the sauna. But at home, KM finds a sock and wonders what this is. She also finds some beer. She thinks WS must have come to their house a lot and thinks they should just live together already. Cut back to the sauna. WS asks SO if she sold the ring, she can tell him, he won’t get angry. SO just rolls over and asks if he remembers. He says he does, he gave it to him. But SO says he gave it to some other woman. He says, who? But she says she doesn’t know it. They finally figure out the secret of the ring. SO says they should leave now and solve this. They go to the bar and start reenacting the scene from that night. They had a lot of soju cocktails and drank a lot. WS wants to drink but SO tells him that they are retracing, not drinking. WS says he went to the restroom….cut to them in the restroom. He says he took out the ring to give it to her and stumbled back out. But that is when he gave it to her. But she says that she never received it. They ask the waitress. She says SO asked her for a cake, but they didn’t have cake as a side dish. A drunk WS tells her that she is crazy, why order cake there, just sit. He tells her that he has something to give her. She is sad though, she says she wants to eat cake. He says, okay, let’s go eat cake. They go to the cake shop and figure out that the ring disappeared there, their memory disappeared there, everything started from there. things are getting more mysterious. so the cake shop owner wants the business? i do not quite understand her motivation. if she is really the girl from the past then she should take revenge on the business, the father and the ones with whom the father worked. I do not see a bright future for WS after lying about the job… SO’s revenge will be sweet… it is so funny how they are always together. and many many thanks for the recaps. sorry I was forgetting. i like that things get funnier. i did not dislike the first episodes, but I can see that now we are getting closer to a solution. I hope at least. No problem! They might be a little late since both of the other shows started. But we will get it out the same day 🙂 I really like how the story is progressing now and I love that the friend is finally showing up in more episodes! I am also super confused by the cake lady. But I do see why WS’s “dead” girlfriend would want to take over parts of the company, probably as the ultimate revenge to destroy it from the inside? That is if the cake lady is the girlfriend. She might just be a new woman who is completely smitten by WS and is trying to two-step her way into his life. I think she’s probably smitten, but I also think I am way off. I hope the 3 kids show up again to help SO on her cases, I love them. Well, not the pervert with the glasses, but I love the other two.